Arrive at 7 pm to participate in a hike with a fascinating astronomy theme guided by a Texas State University astronomer. Or just hang out at the Learning Tree and enjoy sodas, baked goods and sausage wraps for sale while they last. Four days away from full, the moon will cast light on a live performance by the Crystal Creek Boys starting at 8 pm. 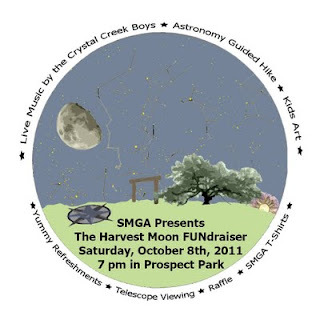 You will be able to look through a telescope to view planetary bodies up close, enter a raffle to win prizes, and take home a new SMGA T-shirt! Bring the kids, and they can participate in some artistic activities. Bring: Cash, beverage of choice (no glass! ), and a flashlight. Directions to Purgatory Creek Natural Area-Prospect Park: From downtown San Marcos, take W Hopkins St. to N Bishop St. Turn west (uphill) on Bishop and left on Prospect St. Go 2.5 blocks to dead end. Park on the street near the kiosk. Parking is limited, so consider carpooling, walking, or biking; a bike rack is available. Follow the lighted trail which winds through the cedar break, and then emerges into the field. From there you will find the fun under the Learning Tree and by the large compass.